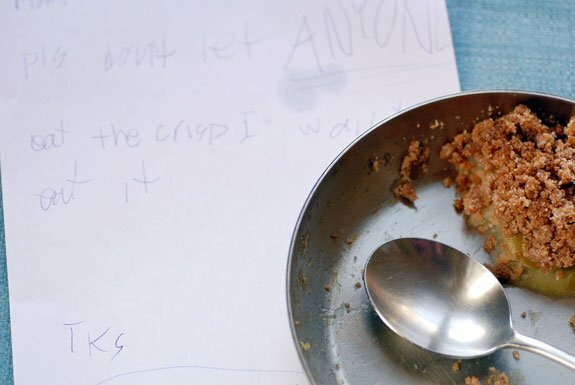 Here’s a lovely seasonal treat –gluten free apple crisp that’s simple and easy to make with very few, and very healthy ingredients. This recipe for Granny Smith Apple Crisp is particularly low carb because I use the low glycemic sweetener xylitol. Since so many people have written to me to tell me they do not use agave, I thought it would be nice to research a variety of alternative sweeteners and experiment with them. Hence the use of xylitol (a low glycemic sweetener) in this recipe. My children couldn’t taste the difference and my doctor highly recommends xylitol for those that can digest it –it is not as easy to digest as agave for some people. As always, use the ingredients that suit you best, and take the time to experiment with substitutions, as I cannot answer your (or my own) substitution questions without actually testing them in real life in my real kitchen. I LOVE ALL OF YOUR RECIPES! I’m actually only 13 years old but when I want to make desserts for after dinner some nights, this is my go to website. I’m making this apple crisp tonight, and even though I haven’t tried it I know it will be awesome. Thank you so much!!!!!!!! what is that ingredient xytiol? is there something i can replace that with? this looks delish! It looks great, Im curious to know what is the size of the baking pan, 8 or 9″? Yummy! Made this with 3 granny smith and one honeycrisp. I subbed in erythritol with the apples (swerve) and used coconut sugar in the topping. And grassfed butter instead of coconut oil. I ate it hot with a scoop of So Delicious vanilla coconut milk ice cream….heaven! Your recipes are so valuable to me. I have to watch my blood sugar and am always surprised and happy about how well I tolerate your recipes. Having a treat is way more fun when it doesn’t sky-rocket my blood sugar.